Little Rock, AR. 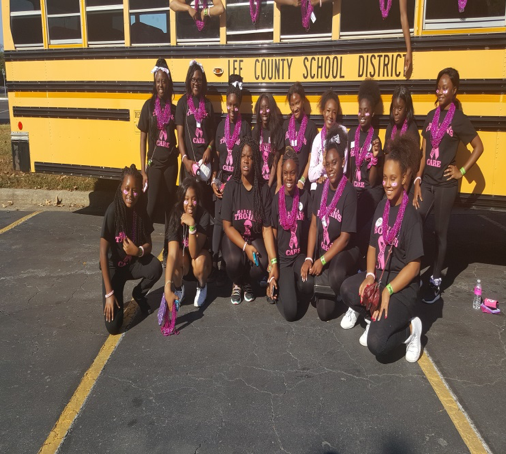 The Marianna Trojans Cheerleaders had the honor of walking in the breast cancer “Race for a Cure” walk on Saturday, October 14, 2017. The students were accompanied by Coach Malinda Dobbins, Assistant Mrs. Jessie Bryant and Peewee Cheerleader Coach Kim Sims. The cheerleaders were present in downtown Little Rock at 7:30 a.m. enthused and ready to walk. They had a chance to meet new people, visit with some home town resident and learn something else about breast cancer. The scholars walked for over 2 miles with thousands of other patrons. There was fun had by all; the energy for the walk was so strong. It was really a beautiful site and the walkers were so energetic that it seems as though they were just walking around the corner. The cheerleaders had a chance to say a few words to the Newscaster from channel 7 news. They were so excited because people were texting them telling them that they saw them on TV. It was a very good day.